This has been another successful year for Riddell Fiddles with concerts all over the Borders and further afield. Recent ventures have included two concerts at Fountainhall and Ashkirk Village halls (sponsored by Creative Scotland funded LIVE Borders Touring). 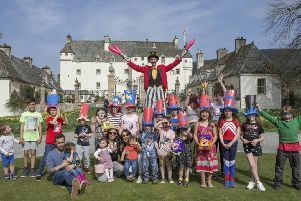 With two junior bands, a ceilidh band and a main fortnightly workshop (not to forget the singing group led by singer Scott Murray), the group appreciates the local community’s support. The annual concert (with thanks to Reverend Frank Campbell) was held at Lilliesleaf Church on Sunday, December 11. This free concert concluded a very busy year. One of the big ventures next year is the lottery funded ‘Tunes ‘n teas party’ which is being held in Bannerfield on Saturday, May 6. Other events include a ‘pop-up’ musical tour (part of the YES Festival) in September and a musical jaunt up the Yarrow and Ettrick Valleys is also being planned.